Great Service at this All-Suite Hotel in Northwest San Antonio. Experience fine Southern hospitality when you stay at the Candlewood Suites San Antonio Northwest Medical Center hotel. Whether you're here for a business trip or family vacation this hotel offers all the amenities you need for a comfortable extended stay in San Antonio, TX. This all-suite hotel in Northwest San Antonio is near the Medical Center, USAA, KCI and the University of Texas Health Science Center. We are also just minutes from Lackland Air Force Base. When it's time to work, set up your laptop at the spacious work desk and check your email using the free Wi-Fi. While in San Antonio, TX, guests can enjoy easy access to some of the city's best attractions. Six Flags Fiesta Texas offers an exciting day of fun for your family! We are just minutes from SeaWorld San Antonio, Malibu Castle and The Shops at LaCantera. Downtown San Antonio, home to the famous River Walk and the Alamo, is just a short drive from the hotel. 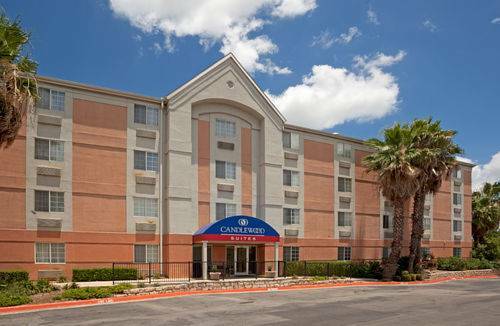 If you're looking for hotels in San Antonio with great amenities, we've got everything you need to feel right at home, including our 24-hour Candlewood Gym, free guest laundry services and an outdoor pool. Borrow your favorite videos and at the Lending Library. You can also stop by the Candlewood Cupboard for various meals, snacks and sundry items at value prices. Whatever brings you to town, our hotel staff is ready to serve you! Children's program - Brackenridge Park, a 343-acre urban park provides a pleasant escape for families. From time-travel at the Witte Museum and an animal encounter at the zoo to a mini train ride and poi counting session with the kids. This 33-acre living museum entices visitors with seasonal floral displays, a serene native forest walk, exotic plant specimens from around the world, and modernistic glass pyramids. Ripley's Believe It or Not! allows you to discover one-of-a-kind oddities, curiosities and illusions gathered from all over the world by the famed cartoonist Robert Ripley. San Antonio's first ever Go Kart Park. Malibu Castle features two 18 hole Miniature Golf Courses, Wheel to Wheel Go Kart Racing, Wet and Wild Bumper Boats, State of the Art Video Game Arcade, and much more. Watch all your favorite sporting events at the AT&T Center! Located midway between Austin and San Antonio at the gateway to the Texas hill country, the San Marcos Prime Outlet Mall is one of the top attractions in Texas. With well over 100 shops and restaurants, it is the place to shop in Central Texas. - Downtown "Old San Antonio"
The San Antonio Zoo is ranked as one of the best zoos in the nation exhibiting over 3,500 animals of 600 species. Located on the banks of the beautiful San Antonio River in Brackenridge Park, the Witte Museum is San Antonio's premier museum focusing on South Texas history, science and water resources. Experience the best in thrilling rides, exciting live entertainment and a free waterpark all at Six Flags Fiesta Texas. Off of I-10 West and Loop 1604. Take exit 555, La Cantera Parkway.